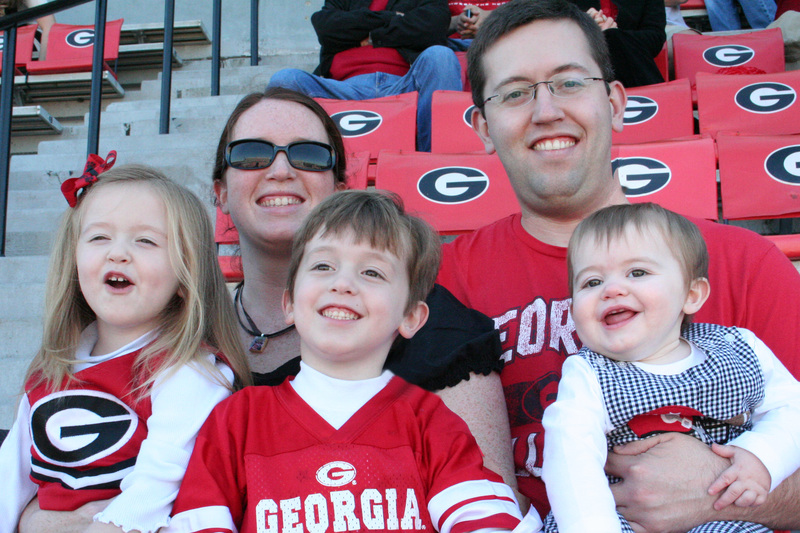 Anyway, after we quit renewing our season tickets, our trips to Sanford Stadium got a lot less frequent. (Neither of us are very good negotiators when trying to buy tickets from a scalper.) Last weekend we had the opportunity to get 7 tickets; enough for us, the kids and Marshall’s parents who live nearby. We had a fantastic time! See? But this post isn’t about any of that. This post is about my sweet, smart boy. Once we left the game, we were in the car passing all the chaos that is gameday. My mother-in-law was in the back seat with the big kids and I heard them talking about all the things that they saw: Lots of people wearing red. A red tent with the “shor-sha”(georgia) G on it. A red light. A stop light. A fence(they meant a road block thing). 2 police men. We all saw the two policemen standing there…one white male, one black male. Carter: Yes. One of them has a hat. How awesome is it to actually be able to see what the next generation sees…how the skin color of the officers didn’t even occur to Tucker…you’re doing a great job Mom! BTW – happiest family picture ever – I think Tucker is a Marshall-mini-me and Emmie and Luke are Bridget-clones. You are all adorable! Awesomeness. And what a great family photo! Love it! And I love that Tucker’s response is a testament to how you and Marshall are raising your kids! A couple of weeks ago, my 4 year old niece was looking at a family picture, looked up at me, and asked why Husband is different. I told her he was born in a different country where they speak a different language and eat different food, avoiding the skin color issue. And yet, I know I have a lifetime of it ahead of me. I did tell her that when Baby Bear is born, he is going to look like a mixture of Husband and me (so he’ll look a little different, too), but then she’s not really sure about the baby-growing-in-the-belly thing…she thinks I’m just getting fat. I pray with much fervor that we see all people through God’s eyes. We are all made in His image. If this generation will teach this by word and action, we have the power to change the world. Way to go Tucker! Such a sweet picture & an even sweeter story!